Description: Maerl beaches, the cast-up remains of coralline algae, are stunningly beautiful marine phenomena found at a few remote locations in the west of Ireland. 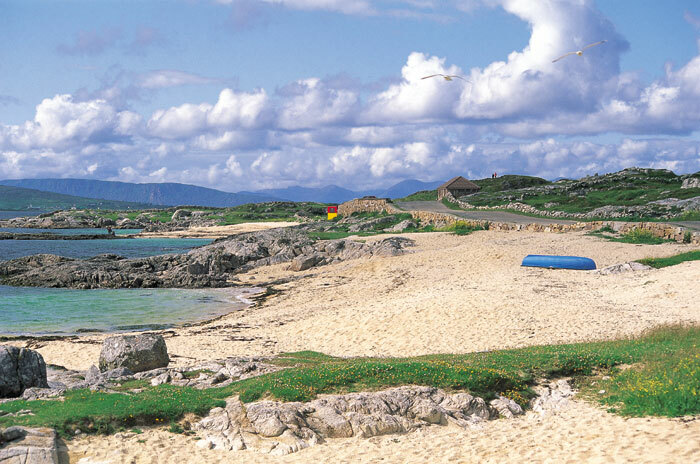 The beach above is at An Cheathrú Rua (Carreroe or Carraroe), Co. Galway about 25 miles west of Galway city. Frequently called "coral strands" or "coral Beaches" they have nothing to do with animal corals but are the remains of seaweeds that grow in detached, rock-like growths in the subtidal. These beaches are a unique and very fragile part of our natural heritage and no such material should be removed; in fact it is illegal to remove any material from Irish beaches without a license. People think that small amounts won't matter, but they do when there are 1000's of people involved. The cast-up material is coarse at the bottom of the beach and increases in fineness as one goes towards high-tide mark (above). Live fragments may be found amongs the dead ones at extreme low water. The upper-shore material is very white and makes for a beautiful beach. 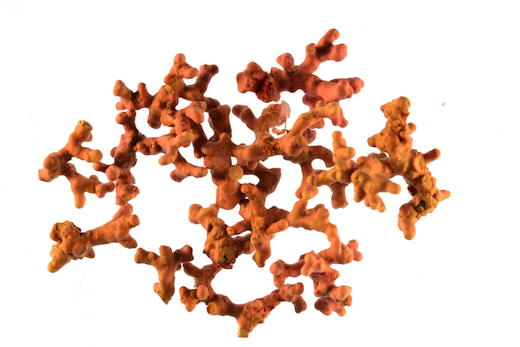 Live maërl, in Galway Bay mainly Lithothamnion corallioides and Phymatolithon calcareum, is pink in colour and is very variable in form. 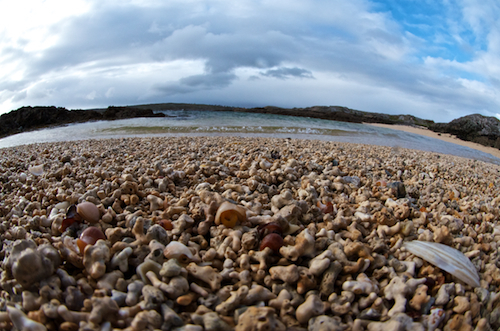 In Galway, maerl beds are found at depths from 0-35 m, but most occur at 2-8 m in sheltered, clear-water locations. Large accumulations of maerl occur in Bantry Bay, Kenmare Bay, greater Galway Bay (from Black Head to Clifden, and estimated at >8 million tonnes), and Clew Bay. Other accumulations occur in the north-east of Ireland, but here many are sub-fossil in nature. Site © M.D. Guiry 2000 - 2019. Important copyright notice: all text, design and photographs on this site are copyrighted by M.D. Guiry unless otherwise stated and all rights are strictly reserved. Click here for copyright information and contact. Website design: 249 Design Studio. Site maintained by M.D. Guiry (michael.guiry@nuigalway.ie). There have been 8736803 page loads since 1 January 2014 on 25 April 2019.